A "blood moon" seen from western Germany during a total lunar eclipse on Sept. 28, 2015. "A full 62 luxurious minutes of totality," says Sky and Telescope Magazine. "The Only Total Lunar Eclipse of 2019," promises NASA. "This full moon will appear to be one of the largest of 2019," reports Space.com. North and South America will get the best view of the super "blood moon," as it's known, but Europeans and Africans will also be able to watch (weather permitting). So, let's break down the hype, starting with the eclipse. A map showing the regions that can view the total lunar eclipse. Unlike a solar eclipse, when the moon gets between Earth and the sun, a total lunar eclipse occurs when Earth aligns to block the sun's light from the moon. That can only happen when the moon is on the opposite side of Earth from the sun. About once a month, a full moon is visible when it nears that far point and shines brightly as Earth covers up most of the sun. But approximately once a year, as the moon travels along its tilted axis, it ends up directly behind Earth and is thrust into near darkness. At 9:30 p.m. ET on Sunday, the moon will start to creep into the part of Earth's shadow known as the penumbra. Not much darkening will be visible yet, according to NASA. By 10:33 p.m. ET, you should see Earth's shadow start to move across the surface of the moon, growing larger and larger and larger until it completely covers it up. 11:41 p.m. ET will mark the totality of the eclipse, as the moon is fully shaded by Earth. That's where the "blood" comes in. There's no violence involved. Instead, the term comes from a reddening of the moon as light leaks around the edge of Earth. 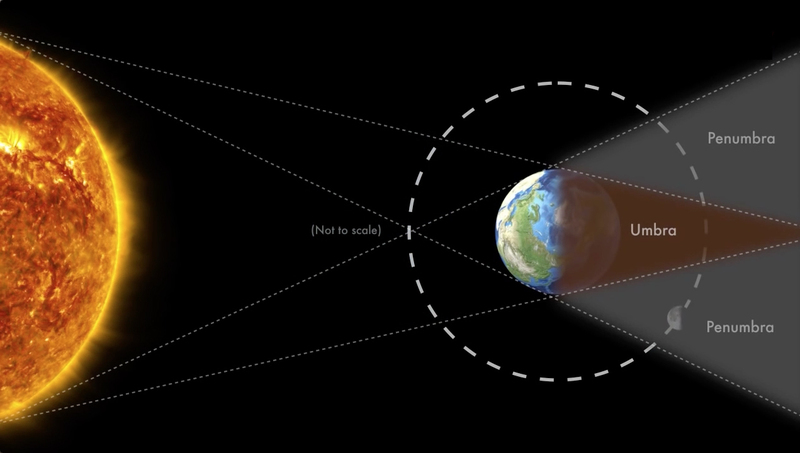 A NASA graphic illustrates Earth's shadow during a lunar eclipse. The moon will stay bathed in our colorful shadow for more than an hour before orbiting back out into the sunlight. As NASA explains, Earth casts a red shadow because of how our atmosphere scatters light. During our days, sunlight coming in from up high is scattered. Short blue lightwaves are bounced around, leaving us with blue skies. But when the sun comes in at an angle — at sunset, sunrise or from the perspective of the moon on the other side of Earth — the sun's reddish light becomes dominant. That light can also change based on dust, pollutants or other particles in Earth's atmosphere. So what about the "super" part of Sunday's show in the sky? The moon's orbit around Earth is not perfectly round, so as it circles Earth it is sometimes closer and sometimes farther away, by a distance of about 26,000 miles. That means that when the moon is at its closest point to Earth — known as the perigee — it can appear up to 17 percent larger than it does at the farthest point in its orbit. Sunday's eclipse will almost coincide with that perigee, meaning that the moon won't just be redder than usual, it will also look a tiny bit wider. It won't take any special equipment to see the total eclipse — no telescopes or dark glasses required. The main impediment to experiencing the relatively rare phenomenon? Weather. 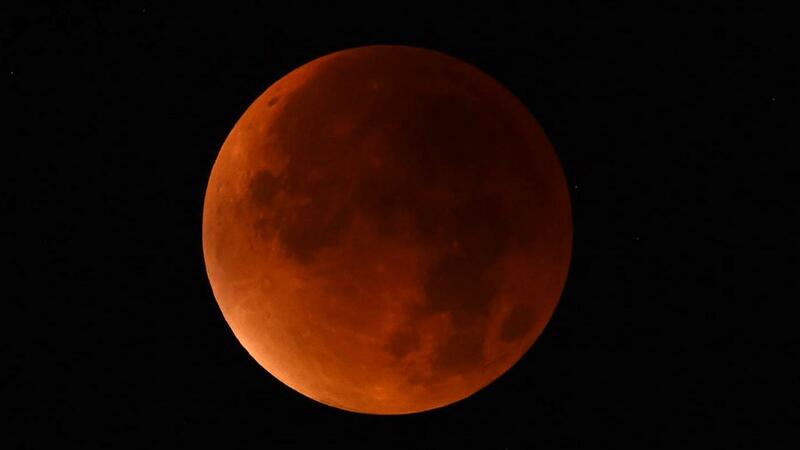 Midwesterners and Southerners should get a good look at the big, red moon. But National Weather Service cloud-cover forecasts show that the Northeast and much of the West might have their views obscured. If you can't catch the eclipse through your window, you can always watch it livestreamed on a screen. Or you can just wait for the Instagram posts. As NPR's Rebecca Hersher has reported, the moon will get its shadowy revenge in a few years: "There will be solar eclipses visible from parts of the contiguous U.S. on Oct. 14, 2023, and April 8, 2024. The one in 2024 will be a total solar eclipse visible from Texas to Maine."